If you've read my blog for some time, you'll know that I'm an avid lover of nails and nail art etc, but being a Mum means I often have to sacrifice having perfect manicures as my nails constantly chip after a day or 2, what with washing up, cleaning, changing nappies and other glamorous motherhood duties. I've had a couple of gel manicures before and must say I did love them, but found the removal process an absolute chore so I've always been put off by getting anymore (plus, as a stay-at-home Mum I definitely can't afford gel manicures at a salon every few weeks). 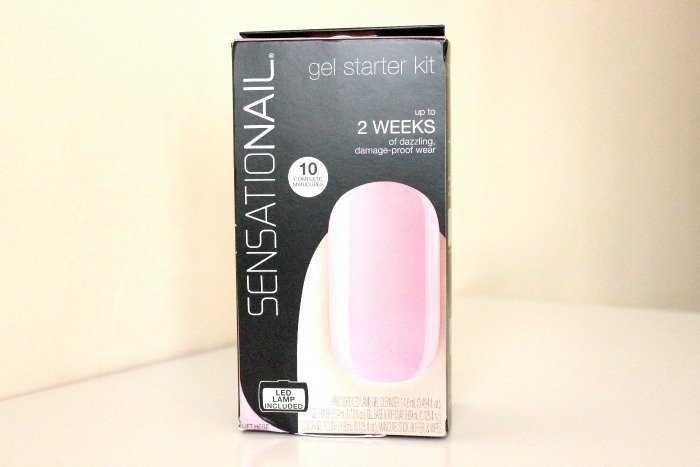 When The SensatioNail Gel Starter Kit in Pink Chiffon* arrived at my door I was keen to see how they compared to that of a salon manicure, but have to admit I was slightly apprehensive about the fact they're a BEAST to remove. Obviously I was still excited to give them a go nonetheless - I'm a sucker for anything I haven't tried! Along with the Starter Kit, I also got a few extra colours (Midnight Rendezvous*, Disco Fever* & Taupe Tulips*) and the Gel Polish Remover*. Step one is, obviously to remove any old nail polish, trim and file your nails, push back cuticles and then gently buff the nails with the buffer (this is to make the nail polish stick better I think). Once you're done, the next step is to cleanse the nail with the Gel Cleanser & Wipes to remove any leftover dust, apply the Gel Primer and leave to air dry. Next it's time to get down and dirty with the lamp (the best bit, lol). 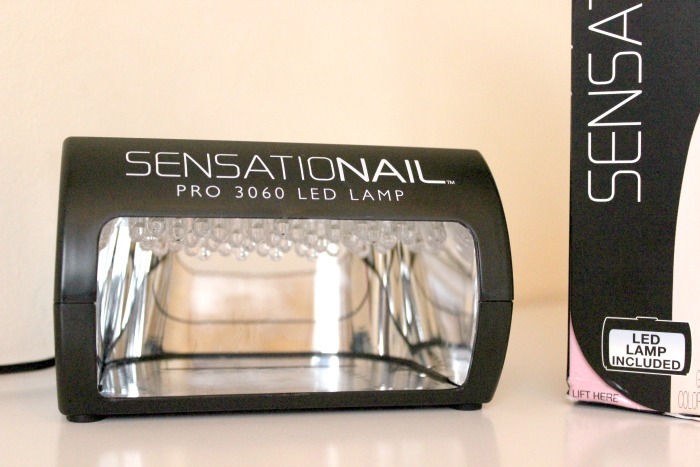 Apply a thin coat of the Gel Base/Top Coat (avoiding the cuticles), lightly cap the nail by running the brush along the open edge and then cure under the lamp for 30 seconds. The lamp is simple to use; it stays on for 1 minute, & beeps after 30 seconds so you know when you're done. I did my four fingers at the same time and my thumb on it's lonesome. Next is to apply the first coat of colour. Apply a thin coat and avoid the sides and cuticles just as you would with normal polish, cap the edge and cure under the lamp for 1 minute. Repeat this step. Finally, add another layer of the Gel Base/Top Coat, curing for 30 seconds. Nails will still feel wet due to the moisture layer, but this is where the final step comes in handy. Simply give the nails another wipe with the gel cleanser to get rid of the moisture layer and VOILA! Sparkly, shiny nails. The first lot I did I was soo pleased with. 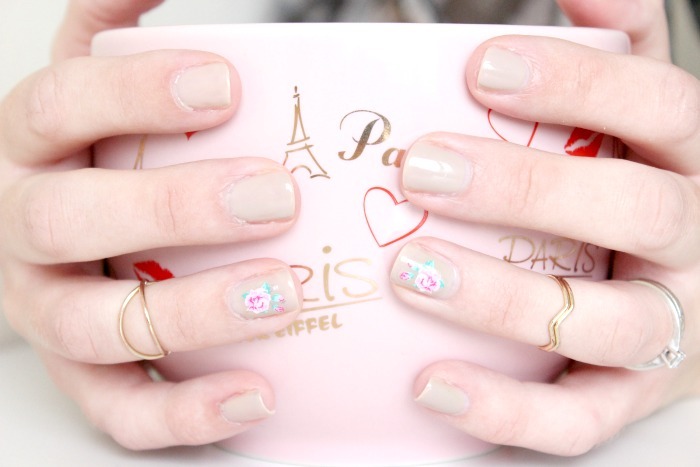 I used the shade Taupe Tulips and added some of my Kiss Gel Dress Flowers* on my ring fingers (I do love an accent nail). I couldn't stop looking at my nails, the finish was fantastic and they were so shiny. I was very impressed with the ease of application and the finish, but I've gotta say I was slightly disappointed with the lasting power. Considering they claim to last upto 2 weeks, I expected them to last at least a week. After 4 days my thumb nail chipped at the edge which I could live with as it was only tiny, but then the next day I had 3 fingers that chipped to the point where they needed removing. I dunno, maybe I didn't cap the nails properly. I won't give up on them just yet, and maybe with more practise I'll get them to last that little bit longer. I really had to resist peeling them off as this can seriously damage the nails. Removal wasn't as bad as I thought it would be, but it was still a faff compared to regular nail polish. First I lightly buffed the nail with the buffer and then I soaked a cotton wool ball in the Gel Polish remover and placed it on my nail, using a piece of foil to hold the cotton ball in place. I left them on for around 20 minutes and then gently pushed the polish off the nail using a cuticle pusher. I then cleaned my nails and applied a coat of my trusty OPI Nail Envy just to protect the nail, before deciding on my next mani. The Starter Kit retails at £69.99 and apparently lasts for 10 manicures, however they also do a Deluxe Starter Kit for £110 which contains 2 colours and lasts for 20 manicures, which is currently HALF PRICE in Boots here. Absolute bargain if I'm honest. Would make a lovely Christmas present for any nail lovers. Gel polish colours retail at £15 each and you can top up the essentials with the Essentials Kit for £25. 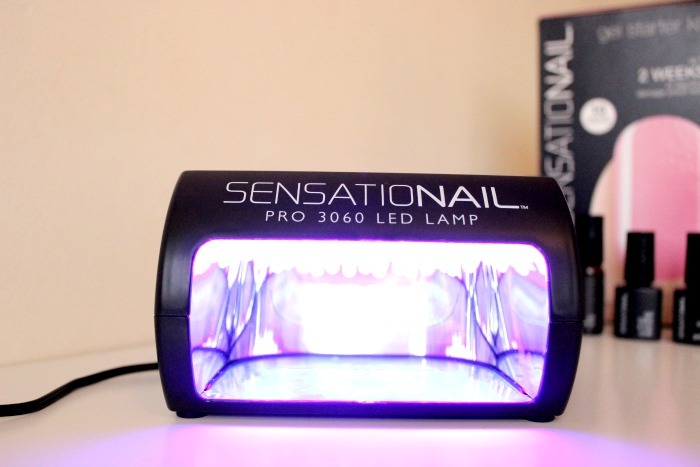 Have you tried a SensatioNail Gel Manicure?